Its Summer and Say Hello to Mango season!!! Succulent, Sweet and absolutely Godly Mangoes, the king of fruits is much loved and most looked forward to. Mango Lassi the mango yogurt shake is best to beat the heat. 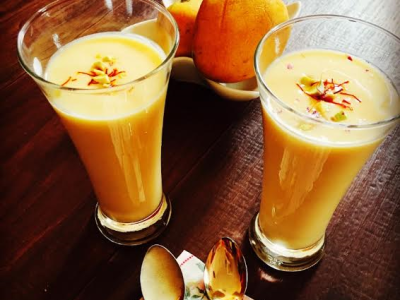 This Delicious smoothie like drink is a perfect blend of Mango, saffron and yogurt. 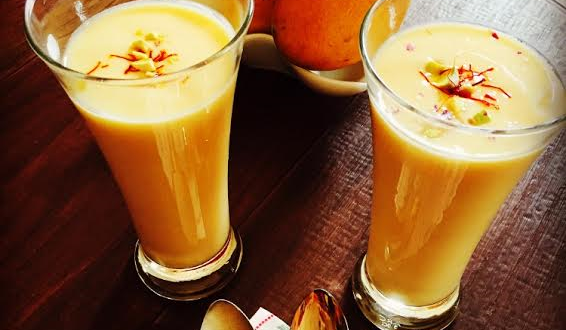 In a small bowl take saffron and milk mix it well ,keep aside this saffron milk. Take the yogurt ,mango, saffron milk, cardamom powder and sugar in mixer and mix it till creamy. Add water and ice cubes blend it until well combined. serve it and garnish with saffron , almonds and pistachio.